MainAll NewsInside IsraelWhy are these illegal mosques not demolished? Why are these illegal mosques not demolished? Regavim reveals hundreds of illegal mosques nationwide ignored or legalized, even as synagogue is slated for destruction. In light of the High Court order to destroy the Ayelet Hashahar Synagogue in Givat Ze'ev northwest of Jerusalem, the Regavim movement for Jewish land rights has exposed the hypocrisy by revealing numerous illegal mosques nationwide that have never been touched by the state. All of the mosques and Muslim religious buildings noted by the group have had demolition orders issued against them over the years, given that they were built illegally without permits, and in many cases on state land, national parks and nature preserves, outside of zoning plans or on private Jewish property. "Nationwide there are hundreds of mosques and non-Jewish religious buildings that were constructed in breach of the law, and the buildings appearing in the documentation here are only those that Regavim worked against with the various authorities," said the movement in a description of the pictures and details. "This is not the matter of a lone incident, but rather an atmosphere in which the state of Israel shows zero tolerance in cases of incursion and illegal building done by the Jewish sector, while showing full tolerance towards cases of incursion and illegal building done by the non-Jewish sector," said Regavim. Photo evidence from Regavim can be seen below. One illegal mosque presented by Regavim was illegally built on an ancient Jewish cemetery in the Jerusalem Walls National Park. In fact, as of January it was revealed that no less than 57 illegal mosques stood in Jerusalem alone. Another blatant case is a mosque that was built in the Arab village of Burin in Samaria on state land. The High Court issued an intermediary order against continued construction and after that order was breached, the court ordered the destruction of the addition - but the building was left standing. 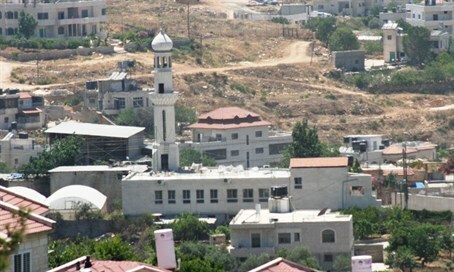 The same treatment was afforded to a mosque built on agricultural land outside the zoning plan of the village Majd al-Krum adjacent to Karmiel in the north. The mosque has been left standing with no action taken against it, and recently two towers were added to it. Regavim also pointed out a large number of Druze religious buildings that were illegally constructed, some of them on nature reserves or state land. Around a year ago the government decided to "legalize" the buildings at the cost of approximately 12 million shekels (around $3.1 million). "The state can legalize when it wants"
Members of the synagogue slated for destruction argue they legally bought the land over 15 years ago, and the synagogue is currently in the process of approval and registration for ownership of the land. However, before the legal dispute over ownership was decided, the High Court ordered to destroy the synagogue due to its lack of building permits. The High Court rejected requests by the state to postpone the demolition due to the security situation, even while authorizing similar requests by the state to postpone the demolition of non-Jewish religious buildings due to the security situation. "It is clear that there is a basic obligation on the state to enforce the law, but a situation in which law enforcement is done selectively and in a discriminatory fashion cannot be accepted," said Regavim. "Therefore it must not be accepted that the state is destroying a synagogue on claims of a lack of legality while it is not enforcing the same law against dozens of mosques and non-Jewish buildings, claiming that they are religious buildings and therefore the 'subject is sensitive,'" the movement added, noting that the same policy "is also in effect against illegal religious buildings built on private Jewish land." "It isn't clear how, over recent years, the government ministries succeeded in advancing many plans to 'legalize' dozens of illegal religious sites of non-Jews, while on the other hand, the government of Israel can't find a solution to prevent the destruction of the synagogue in Givat Ze'ev." "It is clear that when the state wants, the state knows how to legalize illegal building."